Musicians In Motion is proud to offer studio piano lessons at our South Charlotte and Waxhaw locations as well as in-home. We offer several options including traditional, Simply Music and group classes. Simply Music is a great way for beginners to dive in and begin playing the piano quickly or even for students who have had less than 3 years of lessons to have a change of pace. Click here to learn more! Our piano teachers are capable of teaching beginners through the advanced level. 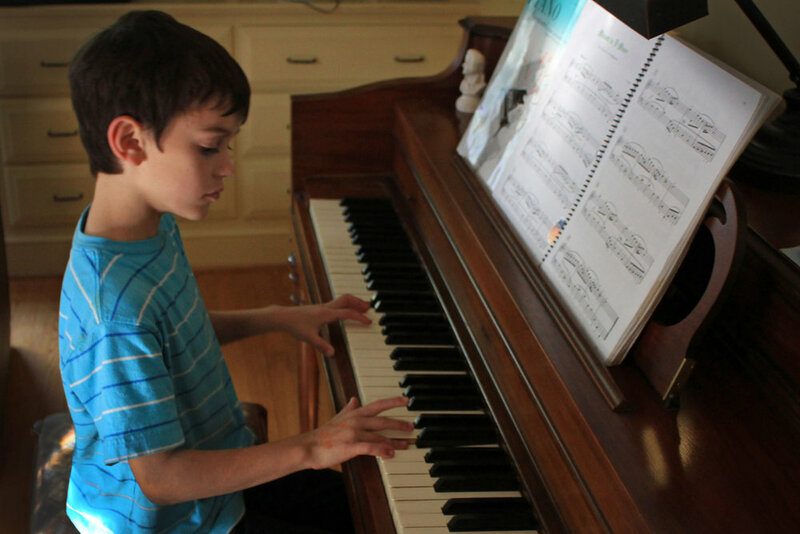 We recommend the youngest starting age for piano to be 8, but there's always the exception! We offer beginner group classes for children 18 months to age 10. Click here to learn more. Not sure which method is for you? Give us a call or fill out a contact form and we'll help you out! Dr. Julia Kinderknecht holds degrees from West Virginia University, the University of North Carolina at Greensboro, and Lenoir-Rhyne University. She has studied with Dr. Peter Amstutz, Dr. John Salmon, and Dr. John Cheek, among other notable instructors. She is the author of "Revolutionary Pedagogy," a scholarly study of the role of improvisation in the music of Beethoven. Julia' career has been full of variety, giving her many years of experience in fields such as big band jazz, opera, composition, praise and worship music, and various styles of improvisation, in addition to her foundation in classical technique and repertoire. She has placed in or won several piano competitions, such as the Rosen-Schaffel Concerto Competition and the WVU Young Artists Competition, and has appeared on stage in collaboration with professionals such as violist Jorge Martinez. One of the most rewarding aspects of Julia's career in music has been her opportunity to serve as a Teaching Assistant at UNCG and also at WVU. In these capacities, Julia had the pleasure of teaching private lessons, group piano, music history, introduction to music, and many other subjects. Julia's love for music orbits around her passion for worshipping Jesus. Music gives her the greatest pleasure when she is praising Him alone at the piano, or with the Church. She has written hundreds of songs to the Lord and loves to put to music the things that He teaches her. She loves her amazing husband, Noah, and her adorable chinchilla, Selah. Thomas S. has been playing the piano for over 15 years. He has taught numerous styles using different techniques and approaches for over 10 years. His writing/playing styles span from Blues, Rock, Jazz, Folk, Pop, R&B, Classical to Latin. This artist is a self taught guitarist, composer and writer, who mainly works in Charlotte, NC. Thomas’s performance and compositional belt notches were derived from his appearances and performances playing with bands in NYC like The Albatross and Velvet Soul from 2000-2002. He has also played with soulful folkish bands like Eddie Kane and Melodic from 2010-2011. He was a regular on local TV shows in Charlotte such as The Modern Renaissance Man and The Johnny Millwater Show on Access 21 TV. He was also invited to play The Harvard Alumni Club in the summer of 2011. In his earlier years he played in various school plays from 2004-2005. Thomas's passion for the arts has proven to be a worthwhile adversary to his list of students over the years. His unique methods of reaching his audience no matter what culture or age range is a God Given gift. Those who have opened their hearts and minds have allowed themselves to experience a teacher who has dedicated his mind, body and soul to each individual person. Tina Booth is a 2013 honor graduate of Winthrop University with a Bachelor of Arts degree in Music; voice concentration. Her vocal performances range in genre from opera to musical theater to southern gospel. She currently sings with the Inspirational group, Melody of Faith. Tina has experience producing and arranging vocals for groups, including the Progressive Southern Gospel Group, The Promise®. One of the songs Tina co-produced, “Shout Before The Walls” was recognized by The Singing News Magazineas a DJ pick hit and has been on several Christian radio charts. Tina has a special fondness for teaching beginner piano students. “I love to see a student’s face light up when they play their first song and then again when they play it for someone else and they actually recognize the tune,” exclaimed Tina. For traditional piano lessons, Tina uses curriculum by Faber & Faber. She is a fully licensed Simply Music instructor. Valarie Alexandra Valois is a concert pianist, collaborative artist , and master teacher who has been involved in making music quite literally since she was four. Dr. Valois actually began teaching when she was seven, and has been working as a professional musician all of her life. She is also a liturgical musician, and enjoys conducting choirs, playing the organ, and arranging sacred music in all forms. She was blessed with an extraordinary group of teachers and mentors, and her studies and performances have taken her all over Europe, The Orient, The Middle East, both North and South America, and Africa. Her students have won many international accolades, and have gone on to become major influences in the music world, as performers, composers, teachers and arrangers, and she presently has a full schedule in the Charlotte, North Carolina area. She also has an extensive background in music therapy. She is learning to play both the Celtic harp and the guitar, and enjoys gardening, cooking, dancing, reading, watching films – and just being alive, sharing life through music and friendship. Christy's love for music started at a very early age. Growing up in western New York, she began singing and playing piano. Soon her interests grew and she experienced playing saxophone, flute, viola, cello, oboe and guitar. Much of her time was spend performing in numerous groups including concert, orchestra, marching and jazz bands. Also, her love of singing landed her spots in many local singing groups. Christy has taken her experience in music and her passion for working with adults and children into a successful career teaching music for over seven years. With a focus an mastering music basics in a atmosphere of fun, her teaching style has helped her students reach their goals and enjoy the process of learning. Christy strives to teach her students the skills they need to be able to interpret music on their own and use their creativity. Currently, in addition to teaching music lessons, Christy is the head of the children's ministry at her local church and assists the worship team by singing and playing keyboard. In her spare time she enjoys the outdoors, spending time with her friends, making art and teaching her cat to act like a dog. Joanna is a graduate of New England Conservatory of Music with a degree in Vocal Performance. She has over 20 years experience teaching vocal techniques, song preparation, audition and performance skills and beginner's piano. She has performed with the Boston Symphony Orchestra, Portland Maine Opera and in Athens, Greece and the Islands. She teaches and loves all genres of music including jazz, musical theatre, pop, classical and opera. She loves to teach any age and any skill level. She currently sings shows of jazz, musical theater and spiritual music at nursing homes through out the Charlotte area. My piano career extends from the age of ten. Since then, my involvement with piano has been colorful ranging from teaching kids to performing in various venues. I was a Musikgarten teacher for preschoolers to begin with, and for many years, I have been a pianist for Korean churches both in Northern Virginia and Charlotte area. My education background, however, is not music related although I have been associated with piano for the last thirty years. I have a BA degree in special education; and afterward I pursued graduate program in theology obtaining master of divinity degree. As I grew up with my nephew who had sight impairment, I developed a passionate heart to help children with special needs. I constantly look for the opportunity to provide piano lessons to children with special needs as I continue to provide regular piano lessons. Micky took the first piano lesson when she was three years old when her mother found her playing nursery rhymes on a toy piano by herself. While her family moved frequently, her piano playing helped her with making friends and being settled in a new environment. As she grew, she developed her musical interest in singing choral music and operetta. Since then, she started studying voice seriously. Even after she received her degree on BA in English Linguistics in Tokyo and worked for a travel agency, she continued studying voice with numerous opera singers privately. Coming to the States, She decided to work toward a Fine Arts Degree in Music while she raised her two children. 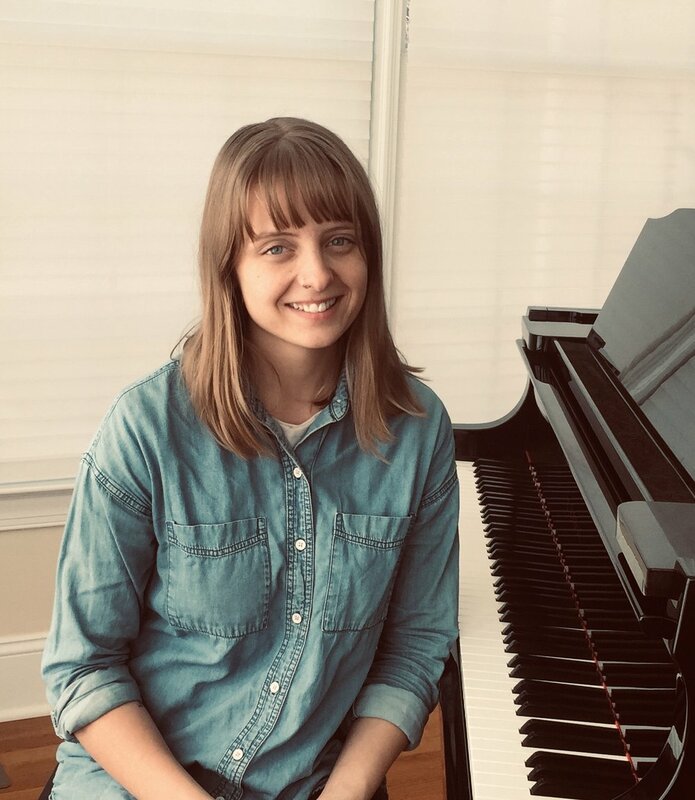 As she began to teach piano and voice privately, she noticed how immensely making music relates to various sensory inputs physically and mentally. She wanted to learn how music can purposely influence people’s body and mind. Currently, she has been studying music therapy at Queens University of Charlotte. She is excited to join the team and put into practice what she learned from the music therapy program. Besides having fun, she wants the lesson environment to be a safe and comfortable place for students to express their thoughts and emotions. From a very young age, Rachel McNichols was instilled with a love for music. She began taking piano lessons at the age of 5 and would continue lessons for 12 years straight, later adding cello, guitar, singing, and songwriting. She first discovered her love of teaching music by helping out her own music teachers and volunteering at camps over the summer. Classically trained, she graduated from Master Musicians School of Music and has been certified in the Mark O’Conner Method of teaching. She has taught students of all ages and has played in multiple orchestras, weddings, church events, and studio recordings. As well as participated in many recitals and scholarship competitions, receiving Superior performance four years in a row. Rachel is passionate about helping encourage each of her students to not only learn and appreciate all types of music, but also reach their goals and become the musician they hope to be. Nathalia was born and raised in Caracas, Venezuela. She first started to play the violin at the age of 5 in the Emil Friedman School in Caracas. Then, at 8 years old she started to play the piano and get music theory lessons. Many teachers from El Sistema, an important music foundation from Venezuela, taught her the passion, discipline, and love that requires being a musician. Since this moment on, she decided she wanted to cultivate these values in young students as well. Since a young age, she participated in string orchestras, choirs, trios, quartets, piano ensembles, and Symphony orchestras of the school. In her last years of High School, she gathered experience teaching violin lessons to the beginners in her school. Furthermore, she participated in the Venezuela Symphony Orchestra and the University of North Carolina at Greensboro Music Summer camp two years in a row. 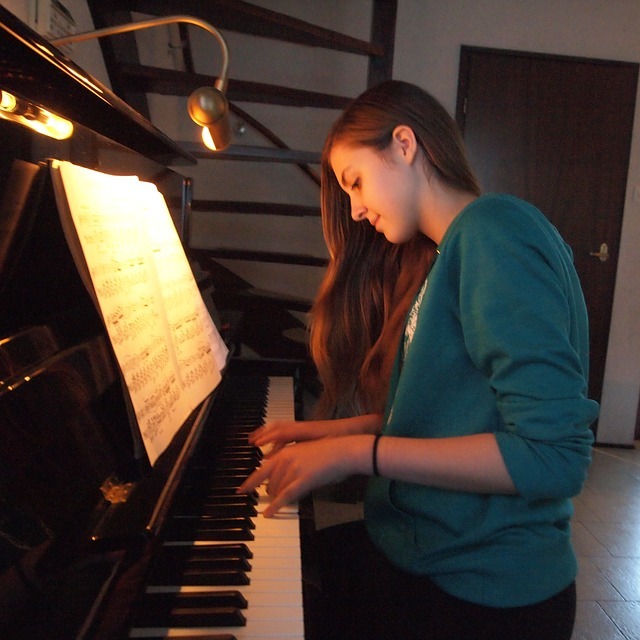 Nathalia believes that music should be developed early in children for a faster learning process. For her, learning two different instruments has brought her many opportunities in life. Nathalia wants to support students, cheer them up, and make them enjoy and love music!